Telespetadór sira televizaun nian sei iha biban hodi aprende kona-ba susesu kampañia justisa ba krime sira hasoru umanidade nian. TVTL sei hatudu filme El Cerco (Serku) kona-ba Patricia Isasa ninia kampañia ba justisa iha Arjentina iha Domingo, 09 Outubru, tuku 08:30 kalan. [Ami husi deskulpa tanba TVTL la tuir sira nia promete atu hatudu filme iha loron 1 Outubro.] Filme ne’e iha dalen Español ho subtítulu iha dalen Inglés no Tetun. Patricia Isasa nu’udar organizadora estudante ho tinan 16 iha Santa Fé, Arjentina, bainhira polisia no soldadu sira kaer na’ok nia no tortura, no hatama nia ba prizaun la prosesu durante tinan rua ho balun iha ida hosi sentru sira detensaun no tortura klandestina 585 ne’ebé harii durante tempu ditadura. Depois batalla legál hodi lori ninia torturadór sira ba justisa, ema na’in neen hosi sira ne’ebé tortura nia simu sentensa ho tinan naruk iha prizaun iha tinan 2009. Sira balun nu’udar majór no juís durante dekada tolu entre bainhira sira komete krime no bainhira hetan justisa. La’o Hamutuk organiza hatudu filme ida ne’e ba preparasaun vizita Patricia Isasa nian mai Timor-Leste iha Outubru, ne’ebé sei inklui ko’alia haleu nasaun ka enkontru ho komunidade no eventu balun iha Dili. Sra. Isasa sei fahe ninia esperiénsia kona-ba ninia susesu luta ba hakotu impuniade iha Arjentina liuhosi lori perpetradór sira krime sériu nian ba julgamentu no preizaun. Ninia esperiénsia sei fó esperansa no motivasaun ba ema Timoran sira ne’ebé kontinua sofre hosi klima impunidade ne’ebé iha daudaun ba krime sira hasoru umanidade ne’ebé komete durante tinan 24 nia laran hosi okupasaun Indonézia iha Timor-Leste. Hakarak informasaun tan, ka atu organiza hatudu filme ne’e ka hasoru malu ho Sra. Patricia Isasa, favor ida kontaktu Jose Pereira iha La’o Hamutuk: jose@laohamutuk.org ka 3321040 ka 736-7518. Timor-Leste television viewers will have an opportunity to learn about a successful campaign for justice for crimes against humanity. 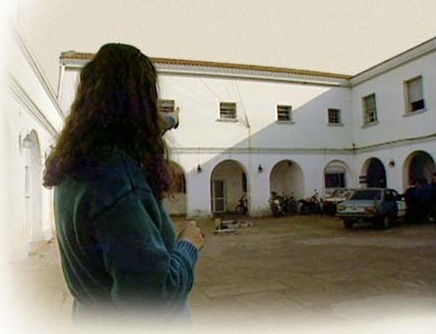 Patricia Isasa was a 16-year-old student union organizer in 1976 in Santa Fe, Argentina, when she was kidnapped by police and soldiers and tortured and held prisoner without trial for two-and-a-half years at one of the 585 clandestine detention and torture centers set up during the dictatorship. After a long legal battle to bring her torturers to justice, six of the people who tortured her were sentenced to decades in prison in 2009. Some of them had become mayor and judges during the three decades between when they committed their crimes and when justice was finally achieved. La'o Hamutuk has arranged for this broadcast in preparation for Patricia Isasa's visit to Timor-Leste later in October, which will include a speaking tour around the country and several events in Dili. Ms. Isasa will share experiences of her successful struggle to achieve accountability in Argentina by bringing perpetrators of serious crimes to trial and prison. Her victory gives hope and motivation to Timor-Leste's people who continue to suffer from the ongoing impunity for crimes against humanity committed during 24 years of Indonesian occupation of Timor-Leste. For more information, or to arrange a showing of the film or a meeting with Patricia Isasa, please contact Jose Pereira at La'o Hamutuk: jose@laohamutuk.org or 3321040 or 7367518.
built without complying with environmental laws. Sentral eletrika oleo pezadu ne’e hari’i dadaun hela lahoo tuir lei ambiental. Last February, Timor-Leste's National Environment Directorate (DNMA) circulated a draft of Timor-Leste's proposed Base Law on Environment. La'o Hamutuk used input from many people to write a 42-page submission. DNMA realized that the law was not ready for enactment, and made many changes. On 20 September 2011, the DNMA circulated a revised draft (Portuguese). They asked for comments within two weeks, prior to submission to the Council of Ministers. DNMA gave La'o Hamutuk permission to circulate the draft on our website, and we have also done a quick, unofficial, English translation. The new draft is significantly improved over the February version, but would still benefit from additional input. We encourage everyone interested in protecting Timor-Leste's environment to look it over. If you have thoughts, you can send them to DNMA directly. Update: On 7 October, La'o Hamutuk submitted our comments on the September draft to DNMA. Iha Fevereiru liu ba, Diresaun Nasional Meio Ambiente (DNMA) fahe esbosu ida kona ba proposta Lei Baziku Ambiental Timor-Leste. La’o Hamutuk uza hanoin sira ne’ebe mai husi ema barak atu hakerek submisaun ho pajina 42. DNMA realiza katak lei ne’e seidauk pronto atu envigor, no halo mudansa barak. Iha 20 Setembru 2011, DNMA fahe esbosu ne’ebe hetan revizaun iha Portugese. Sira husu komentariu iha semana rua, molok hato’o ba Konseilu Ministeriu atu hetan aprovasaun. DNMA fo lisensa ba La’o Hamutuk atu fahe esbosu ne’e iha ami nia website, no ami halo tradusaun Ingles ho lalais no la ofisial. Ami husu deksulpa tanba seidauk iha tradusaun ba Tetum. Esbosu foun ne’e hadiak ho signifikante kompara ho versaun iha Fevereiru, maibe sei iha benefisiu nafatin atu hetan hanoin adisional sira. Ami enkouraza ema hotu ne’ebe interese ba protesaun ambiente Timor-Leste nian atu tau matan ba lei ne'e. Karik ita boot sira hakarak atu ajuda La’o Hamutuk atu dezenvolve idea ba ami nia submisaun, favor haruka ita boot sira nia sujestaun iha karta eletroniku ba environment@laohamutuk.org molok loron 30 Setembru. Liga ba esbosu lei iha Fevereiru, no mos analiza no komentariu. Iha konferensia Inisiativa Transparensia iha Industria Ekstrativa (EITI) iha fulan kotuk, Ministra Finansa loke oituan sesaun foun Portal Transparensia nian kona-ba aprovisionamentu. La’o Hamutuk apresia ba inisiativa ne’e, ne’ebe sei lori Timor-Leste ba iha diresaun ne’ebe los, aumenta informasaun publiku no hamenus posibilidade ba kolusaun no korupsaun. Maske dalaruma susar atu utiliza no presiza asesu internet, Portal ne’e kompostu husi informasaun sira ne’ebe iha valor kona-ba kontratu sira ne’ebe asina durante tinan tolu liu ba. Ami download ona informasaun sira husi portal ne’e kona-ba kontratu 288 ne’ebe nia valor kada projeitu nian tokon $250 ba leten no tau iha spreadsheet ho tu-tuir malu ne’ebe bele halo informasaun ne’e sai fasil atu hetan asesu. Infelizmente portal ne’e la inklui buat barak kona-ba “Oportunidade Negosiu,” maibe hatudu deit tenderizasaun nakloke tolu, rua husi ne’e taka ona iha Agustu. No iha parte seluk Tenderizasaun Foun iha website Ministeriu Finansa nian hatudu tenderizasaun nakloke hat, no hat seluk hein atu fo kontratu. Tenderizasaun nakloke iha parte Ministeriu Finansa nian inklui ida ba konsultan atu halao Avaliasaun ba Impaktu Ambiental ba projeitu infraestrutura petroleu Tasi Mane. La’o Hamutuk konkorda ho kontrator lokal sira katak projeitu ida ne’e nudar lakon oportunidade ida atu uza osan povo nian hodi suporta servisu lokal no negosiu kiik sira, no uza material konstrusaun lokal, maske Governu hateten katak razaun atu importa "uma standar, pre-fabrikadu… atu kompleta konstrusaun ba uma foun sira iha tempu ida ne’ebe apertadu liu.” Aleinde ne’e, husu kompania ida deit atu importa no hari uma rihun sanulu esklui tiha negosiu kiik sira husi konkursu tenderizasaun nian. Ami mos kestiona ho parte material rezerva ne’ebe importa mai (suku cadang) no konhesimentu atu halo manutensaun ba uma sira ne’ebe harii ba povo iha area rural sira hodi hela ba bainhira kompania ne’ebe importa sasan sira ne’e sai ona. At the Extractive Industries Transparency Initiative (EITI) conference last month, the Minister of Finance unveiled the Transparency Portal's new section on procurement. La’o Hamutuk applauds this initiative, which moves Timor-Leste in the right direction, increasing public information and reducing possibilities for collusion and corruption. Although sometimes cumbersome to use and requiring internet access, the Portal contains valuable information about contracts signed during the past three years. We have downloaded the Portal’s information on 288 contracts worth at least $250,000 each and put it in a sortable spreadsheet which may make it more accessible. Of the $1,100 million in listed contracts, $844 million (including six of the largest seven contracts) was spent on electricity. The largest contract was awarded last September: $406 million to Puri Akraya Engineering to build the heavy oil power plants at Hera and Betano. Unfortunately, this contract had no public tender and was signed with a just-formed Indonesian company, 69% of whose shares are held by “Dooks Group Holdings Ltd.” of the British Virgin Islands. Unfortunately the portal doesn’t yet include much about “Business Opportunities,” showing only three open tenders, two of which actually closed in August. On the other hand, Current Tenders on the Ministry of Finance website shows four open tenders, and four other intents to award contracts. The open tenders on the MoF site include one for a consultant to conduct an Environmental Impact Assessment for the Tasi Mane petroleum infrastructure project. La’o Hamutuk agrees with local contractors that this project is a lost opportunity to use public money to support local employment and small businesses, and to use local materials, notwithstanding the stated rationale for importing “standard, pre-fabricated houses ... to complete the construction of new houses within a tight timeframe.” In addition, requiring a single company to import/build ten thousand houses excludes small businesses from bidding. We also wonder about the availability of imported parts and skills to maintain the houses once rural people are living in them and the importer has moved on. Beaco: LNG Plant complex, Nova Beaco, Nova Viqueque, Viqueque airport. On 25 August 2011, the National Procurement Commission invited bids from consultants to conduct Environmental Impact Assessment (EIA) for these projects. The deadline for submitting bids is 26 September, and bidding documents are available here. La'o Hamutuk has created a new web page with photos, maps and links to relevant documents. 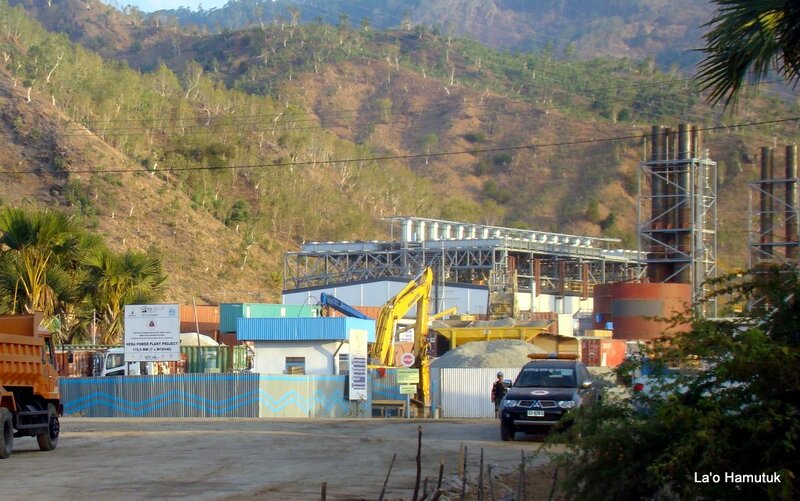 In addition to an overview of the Tasi Mane project and EIA tender, the page discusses the project's implications for sustainable development in Timor-Leste, the $16 million in contracts already awarded, and the protest over land confiscation in Betano and the Government socialization in response. We will continue to update this page, and welcome additional information. Thank you. Hare pajina web kona-ba lansamentu, ka download Relatoriu tomak ka aprezentasaun fo sai iha lansamentu. 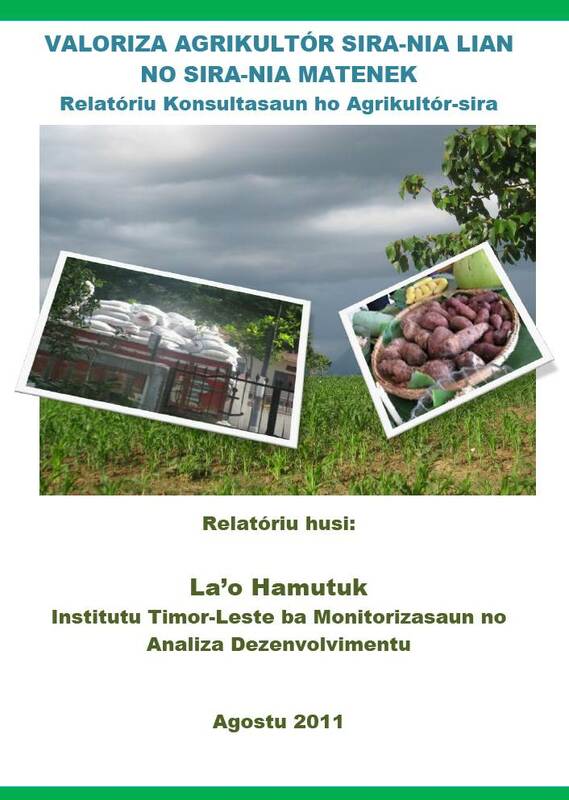 La'o Hamutuk's Report on Consultation with farmers can also be downloaded in English. “Ami sente moris hanesan agrikultór husi tempu uluk to’o agora laiha mudansa ida, ami nia moris mak hanesan ne’e nafatin hela de’it, no dalaruma sai aat liu tan” hato’o agrikultór ida husi distritu Manufahi-Same. “Ami la hatene saida mak Ministeriu Agrikultura nia planu, satán Orsamentu. Ami rona de’it dehan Parlamentu aprova osan juta ba juta (millões) maibé ami la hatene osan sira ne’e mout hotu ba ne’ebé?” Agrikultór ida husi Ermera hato’o nia frustrasaun. Lian sira ne’ebé ami sita iha leten, mai husi konsultasaun durante besik tinan rua nia laran ne’ebé halo hahú iha tinan 2010. Relatóriu Konsultasaun ne’ebé ho titulu Valoriza Agrikultór Sira-nia Lian no Sira-nia Matenek, mosu liu husi konsultasaun klean ne’ebé La’o Hamutuk halo ho agrikultór no komunidade sira iha area rural kona-ba sira esperensia moris lor-loron nudar agrikultór no nudar komunidade iha area rural. Informasaun sira iha relatóriu hot-hotu mai husi agrikultór no komunidade sira. La’o Hamutuk fasilita de’it atu sira-nia lian ne’ebé sira hato’o mai La’o Hamutuk bele to’o duni ba na’i-ulun Governu sira no mos instituisaun la’ós Governu sira ne’ebé servisu ba dezenvolvimentu Timor-Leste nian. Iha asuntu barak ne’ebé agrikultór sira koalia no ami fiar katak sei labele reprezenta 100% sira-nia lian, maibé ami koko fahe buat ruma ba públiku, ba Governu Timor-Leste, ba Nasoens Unidas no nia Ajénsia sira, ba Doadores sira, Instituisaun Finanseiru Internasional sira, ba Organizasaun Naun Govermental sira no mos ba parte hotu ne’ebé involve iha prosesu dezenvolvimentu agrikultura Timor-Leste nian. Difikuldade ne’ebé agrikultór sira hasoru iha sira-nia moris loron no saida mak sira-nia forsa. Suporta ne’ebé durante ne’e agrikultór sira simu husi Governu no instituisaun seluk. Faktores sira ne’ebé durante ne’e sai fonte difikuldade ba agrikultór sira. Rekomendasaun balu ba Governu no instituisaun sira ne’ebé halo servisu ba agrikultór sira. Konsultasaun ne’e hala’o iha distritu Ermera, Bobonaro, Manufahi no Oecussi. La’o Hamutuk hein katak prezensa relatóriu ida ne’e nian bele hadi’ak liu tan Governu no parte hotu nia servisu, nune’e bele hadi’ak duni ita boot sira-nia moris nudar agrikultór no nudar komunidade ne’ebé hela iha area rural. Grupu sira ne’e argumenta katak “infez ita repete erru sira ne’ebé nasaun sub-dezenvolvida sira komete iha pasadu, iha ne’ebé sira luta ona durante dekade barak nia laran, Timór-Leste tenki aprende hosi esperiénsia hirak ne’e, ne’ebé dala barak lori naha todan ba sira nia emar sira. Karta ida ne’e inisia hosi Movimentu Kontra Deve iha Timór-Leste (fasilita hosi La’o Hamutuk), no East Timór and Indonesia Action Network (ETAN) ne’ebe nia baze iha Estadus Unidus da Amerika (EUA). Statementu kompletu iha Tetum no Inglesh hamutuk ho organizasaun sira ne’ebé asina bele hetan iha http://www.etan.org/news/2011/08debt.htm no http://www.laohamutuk.org/econ/debt/2011/11ETANMKDStmt5Sep2011.htm. Statementu ida ne’e hetan suporta hosi organizasaun 117, husi nasaun 28. Rede internasional sira ho esperiensia luta naruk kontra naha todan deve nasaun sub-dezenvolvido sira nian asina hotu statementu ne’e, inklui: Focus on Global South, Jubilee South – Asia Pacific Movement on Debt and Development, Third World Network and CADTM International (Committee for the Cancellation of Third World Debt). Grupu 20 iha Timór-Leste mak asina statementu ne’e, inklui Institutu Timór-Leste ba Monitor no Analiza Dezenvolvimentu (La’o Hamutuk), Forum ONG, Front Estudante, Forum Lider Comunitario, Fundasaun Haburas no ETADEP. Organizasaun sira hosi Sudeste Asiatiku, vizinho Timór-Leste nian, inklui WALHI - Friends of the Earth Indonesia, Freedom from Debt Coalition ¬ Philippines, International NGO Forum on Indonesian Development (INFID) and EARTH (Ecological Alert and Recovery Thailand). Organizasaun seluk ne’ebe asina, inklui grupu sira ne’ebé advoka ba dezenvolvimentu sustentavel, mos suporta povo Timór-Leste iha tempu naruk nia laran, hanesan Jubilee EUA, International Platform of Jurists for East Timor, Oil Change International (EUA), Aidwatch (Australia), Friends of the Earth U.S., Bank Information Center (EUA), Tapol (Inglatera), CAFOD (Inglatera), Japan East Timor Coalition, and the Free East Timor Foundation (VOT, Utrecht, Olanda). Rendimentu hosi mina-rai no gas fornese 95% ba rendimentu estadu Timór-Leste nian, halo nasauin ida ne’e sai nudar nasaun ho nia dependensia ba petroleu ne’ebe as liu iha mundu. 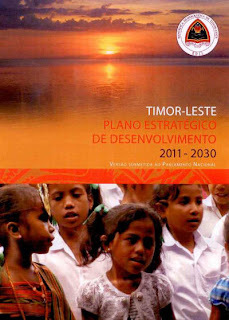 Maski Timór-Leste seidauk impresta osan hosi nasaun seluk, ka instituisaun finanseiru internasional, governu Timór-Leste aprova ona lei balu atu bele deve, inklui Lei Orçamentu e Gestão Financeira 2009, no mos revizaun Lei Fundu Petróleum, no Lei foun ba Divida Públiku. Lei rua ne’e hetan aprovasaun semana rua liu ba. Iha inísiu fulan Agostu, Website Banku Dezenvolvimentu Asiátiku (ADB) publika proposta deve hamutuk $8.15 millaun ba Timór-Leste atu hadi’a rede dalan nasional Timór-Leste nian. Movimentu Kontra Deve nudar koalisaun organizasaun sosiedade sivil ida iha Timór-Leste ne’ebé kontra Timór-Leste atu deve. ETAN mak organizasaun fo solidaridade ba povo Timór-Leste durante tinan 20 nia laran, ne’ebe nia base iha EUA. Ita-boot bele nformasaun tan kona-ba Timor-Leste no deve iha Inglesh ka Tetum. Pending loans could endanger Timor's future. Timor-Leste and international organizations today urged "the government of Timor-Leste to keep the nation debt-free and refrain from borrowing money from international lenders.... to protect its future generations." The groups argue that "Rather than repeat the mistakes of other developing countries that have struggled with debt during recent decades, Timor-Leste should learn from their experiences, which often inflicted great hardships on their people." The letter warns that, despite Timor-Leste's current petroleum wealth: "When Timor-Leste's oil and gas run out in less than 15 years, and debts still must be repaid, Timor-Leste's children and grandchildren will suffer the consequences." The letter was initiated by Timor-Leste's Movimento Kontra Deve (Movement Against Debt, facilitated by La’o Hamutuk) and the U.S.-based East Timor and Indonesia Action Network (ETAN). The full text of the statement in Tetum and English with a complete list of signers can be found at http://www.etan.org/news/2011/08debt.htm and http://www.laohamutuk.org/econ/debt/2011/11ETANMKDStmt5Sep2011.htm. The statement was endorsed by 117 organizations based in 28 countries. International networks with long experience in opposing onerous debt on developing countries are among the signers, including: Focus on the Global South, Jubilee South - Asia Pacific Movement on Debt and Development, Third World Network and CADTM International (Committee for the Cancellation of Third World Debt). 20 groups in Timor-Leste signed the statement, including the Timor-Leste Institute for Development Monitoring and Analysis (La’o Hamutuk), NGO Forum, Student Front, Community Leaders Forum, Haburas Foundation and ETADEP. Signing organizations from Timor-Leste’s southeast Asian neighbors include WALHI - Friends of the Earth Indonesia, Freedom from Debt Coalition ­ Philippines, International NGO Forum on Indonesian Development (INFID) and EARTH (Ecological Alert and Recovery Thailand). Other signers include sustainable development advocates and groups that have long supported the people of Timor-Leste, such as Jubilee USA, the International Platform of Jurists for East Timor, Oil Change International (USA), Aidwatch (Australia), Friends of the Earth U.S., Bank Information Center (USA), Tapol (U.K.), CAFOD (U.K.), Free East Timor Japan Coalition, and the Free East Timor Foundation (VOT, Utrecht, the Netherlands). Income from oil and gas provides 95% of Timor-Leste's state revenue, making the country the most petroleum-export dependent in the world. Although Timor-Leste has not yet borrowed funds from other countries or international financial institutions, the government has passed several laws to enable borrowing, including the 2009 Budget and Financial Management Law, as well as revisions to the Petroleum Fund Law and the new Public Debt Law both passed just two weeks ago. In early August, the Asia Development Bank posted information on its website about a proposed $8.15 million loan to Timor-Leste to upgrade the national road network. The Movimento Kontra Deve is a coalition of civil society organizations in Timor-Leste opposed to the country taking out loans. ETAN is a 20-year old U.S.-based group working in solidarity with the people of Timor-Leste. 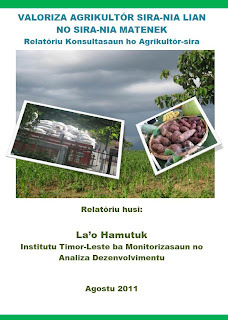 Click for additional background on Timor-Leste and borrowing is in English and Tetum. Iha semana balun liu ba, Wikileaks publika sira nia koleksaun tomak husi kabela eletronika konfidensial nian liu 250,000 ne’ebe sira hetan husi Departamentu Estadu (Ministeriu Negocios Estrangeiros) Estadus Unidus nian. Dokumentus sira ne’e nudar fontes ka janela ne’ebe molok ne’e nunka mais akontese kona-ba Governu Estadus Unidus nian, liu-liu nia embaixada sira, ba observa no influensia nasaun sira seluk. Website Wikileaks nian susar atu asesu (no server balun blokeia website ne’e, inklui server sira iha Departamentu Estadu nian rasik), tamba ne’e La’o Hamutuk publika sai lista husi kabela eletronika 391 ne’ebe iha relasaun ba Timor-Leste. Ami liga ba tekstu kompletu nian no publika tiha balun ne’ebe interesante liu iha format PDF ne’ebe bele download. Kabela eletronika sira ne’e husi inisiu 2006 to’o iha inisiu 2010, hatudu katak Estadus Unidus iha interaksaun ho Timor-Leste iha dalan balun ne’ebe interesante, inklui diskusaun barak ho partisipantes nivel altu iha krize 2006. Ida be’e foun liu mak, Embaixada Estadus Unidus nian fo korajem ba boa-governasaun, sustentabilidade no justisa. Maibe iha tempu ne’ebe hanesan, Estadus Unidus husu ba Timor-Leste atu suporta pozisaun Estadus Unidus nian ba asuntu sira hanesan Kuba no Mudansa Klimatika ne’ebe dalaruma kontrariu ho povo Timor nia hakarak. Embaixador Hans Klemm hatudu hodi halo advokasia ida ba rai ida ne’e, hodi husu ba Washington atu kansela Alerta de Viagem iha Setembru 2008, no halo advokasia atu kontinua fundu MCC nian ba Timor-Leste. Nia no Embaixada iha Jakarta husu ba ofisiais Indonezia no Timor-Leste atu fo dalan ba prosesu julgamentu tribunal nian ba lider milisia Maternus Bere ne’ebe hetan tiha ona akuzasaun, no konsistente ho Konstituisaun no lei. Estadus Unidus mos diskoraje ho kriminalizasaun ba defamasaun no uza perdaun ba ema barak, no lei amnestia nian ne’ebe hanesan atu kua tiha direitus umanus no estadu de direitu demokratiku. A few weeks ago, Wikileaks published their entire collection of more than 250,000 leaked U.S. State Department cables on the internet. They are an unprecedented window into how the U.S. Government, especially its embassies, observes and influences other countries. The Wikileaks website can be difficult to access (and is blocked by some servers, including those of the State Department itself), so La'o Hamutuk has posted the list of 391 cables related to Timor-Leste. We link to all the full texts and have posted some of the most interesting ones as downloadable PDFs. The cables, from early 2006 through early 2010, show that the U.S. has interacted with Timor-Leste in some interesting ways, including many discussions with high-level participants in the 2006 crisis. More recently, the U.S. embassy has encouraged good governance, sustainability, and justice. At the same time, it urged Timor-Leste to support U.S. positions on issues such as Cuba and Climate Change which may be contradictory to the Timorese people's wishes. Ambassador Hans Klemm appears to have been an advocate for this country, urging Washington to cancel its travel warning in September 2008, and encouraging the continuation of MCC funding for Timor-Leste. He and the U.S. embassy in Jakarta urged Indonesia and Timor-Leste officials to allow the prosecution of indicted militia leader Maternus Bere to proceed, consistent with the Constitution and the law. The U.S. also discouraged criminalizing defamation and the widespread use of pardons and the amnesty law as undercutting human rights and the rule of law.